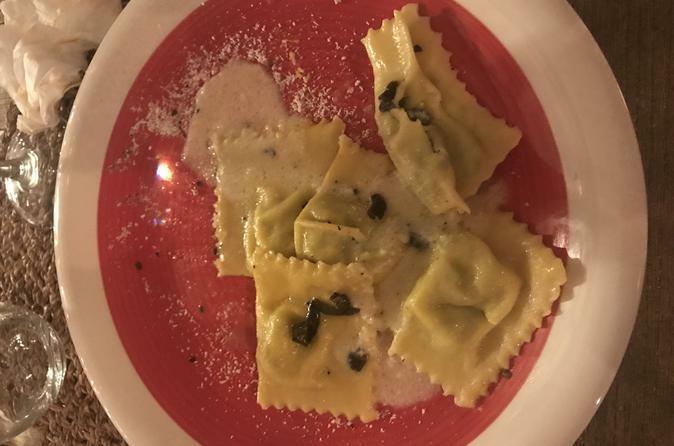 I had an excellent time learning to make homemade pasta. The environment was awesome and the instructors took their time explaining and having a good time with everyone as well. I would highly recommend doing this!!! Our cooking class with Luca and Francesco was an awesome experience. I was a little skeptical when we first booked it because I wasnt sure if it was going to be worth it. We researched a bunch of different classes but eventually settled on this class, and we couldnt be happier with our choice. Luca and Francesco were both fantastic teachers and made the entire night very memorable. The small group setting worked perfectly as you got enough attention to make sure you didnt mess up any of the pasta. The meal ended up being delicious and probably one of the best ones during our stay in Rome. If you're deciding between a few classes, dont hesitate to pick this one! Absolutely loved this Pasta Making Class with Francesco and Manuela. It was a great, unique activity to participate in, in Rome. We had the opportunity to make 2 different pastas from scratch...and it was nice to relax after and enjoy the food that we'd all made ..a great team effort with good instruction from our talented chefs. We just missed out on learning to make Tiramisu as that class starts in April, but we'll be back. Thanks again to both Francesco and Manuela!! Would definitely recommend this class and do it again! Coordinator at pickup site was warm and welcoming and quickly led us to apartment. Chefs were so animated and informative. They made evening very fun.. and food was delicious! It was clear everyone in group was having a great time! literally this was an amazing experience. Both of the chefs are just splendid. They explain about how to make pasta in "normal" language, makes this very easy to understand. I definitely refer this attraction when you visit Rome. We wanted to do the class but were unsure. We’re so glad we did!! We had a great time. The group we were with was diverse, newlyweds, college friends, just out of college friends and a family with adult children. The Chefs watched over everyone and wouldn’t let us fail, the pasta fantastic and the sauces we made were tasty. We had a great time eating our creations! 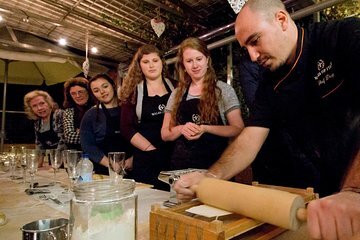 Our pasta making class was one of the highlights of our trip to Italy. Our chefs were personable and great teachers. It was a wonderful experience from start to finish! This was an amazing experience and I will always remember it. Frederica and Roberto were the BEST and the food was amazing. They gave us a bunch of recommendations and were so friendly! Please, please, if you are in Rome, please book this, you won't regret it!